I took the road less travelled - Route 41, but you could just as easily take Alligator Alley I-75. I was planning on taking the tram ride at Shark Valley, but by the time I got there it was just too darn hot to even think of getting out of the car. 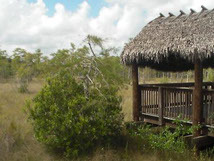 But this road has plenty of interesting stops to allow you to get a flavour of the Big Cypress/Everglades area. The drive down through Homestead to the Keys on the South Dixie Highway is, quite frankly, one of the dullest stretches of road I've ever encountered, which is dangerous in a whole other way. Thankfully the radio improved as I headed down with a Miami and Florida Keys flavour coming through. If you are at all tired I recommend the alternate road across Card Sound 905A which I took on my drive back up to Miami and which allows you to check out the local scenery and reduces the risk of you just nodding off through boredom. Once you hit the Keys just watch out for the mile markers, and get used to crossing that road!